It’s well known that Walt Disney had large format, elegant maps made as part of the proposals to secure investment for the creation of Disneyland in California in the early 1950s. The perspective views of the imaginary land he envisaged, drawn by Herbert Ryman, were crucial to securing the finances he needed for the project. Another iconic map, by Peter Ellenshaw was featured on early souvenir postcards and brochures of the park. Ellenshaw was an acclaimed artist and visual effects pioneer who worked on many of Disney’s films and is credited with the first official map of Disneyland. 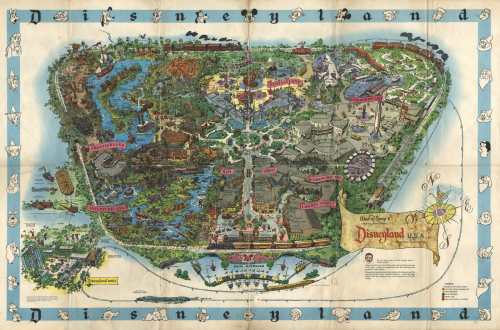 Disneyland opened in 1955 but an early oversight, or lack of time and funds, meant that the first souvenir map proper wasn’t available to purchase until 1958. Neither the Ryman or Ellenshaw maps were to be used. 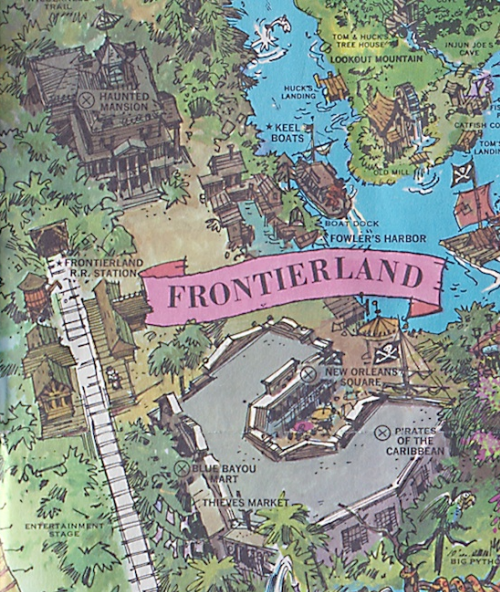 Instead, Disney artist and Imagineer Sam McKim became the master of Disney’s theme park maps. Actor turned artist McKim’s drawings inspired many of Disney’s films and theme park attractions but it is his early, intricate and fascinating theme park souvenir maps for which he is renowned. The maps are rich in detail, contain perfectly positioned drawings amongst the landscape and the text and labels sits effortlessly in the design. There are characters, animals and motion depicted throughout (e.g. running or flowing water) to give a sense of a living, breathing, exciting place. What better way to remember your time in the ‘happiest place on earth’ than by taking home a map and pinning it to your wall. The detailed pictorial style of McKim’s map matched the enchantment of the park itself, allowing one to relive a visit and also think out and plan the next. 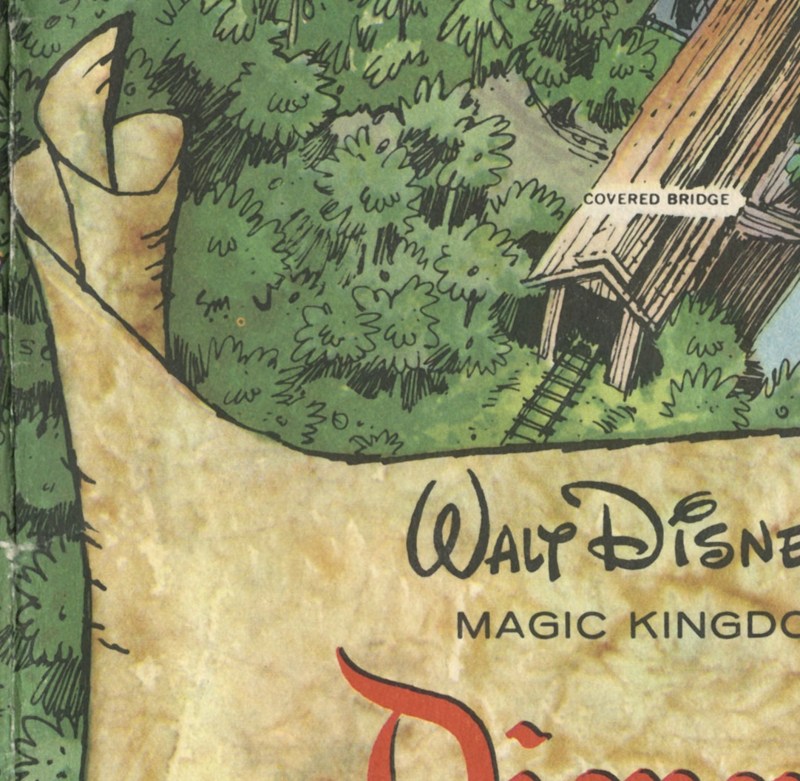 The map’s detail is labyrinthine and encouraged deep exploration to uncover all of the pieces in the park which, quite simply, was impossible during a single visit to the park itself. The map, then, became an intrinsic part of the experience and even though the park was an imagined environment, the presence of such a map brought a sense of realism and permanence. Even when you are not in the park, you can pour over the map and experience it all over again. The ability of McKim to convey the sense of wonder that Disney wanted the park to evoke is a classic piece of cartographic story-telling. 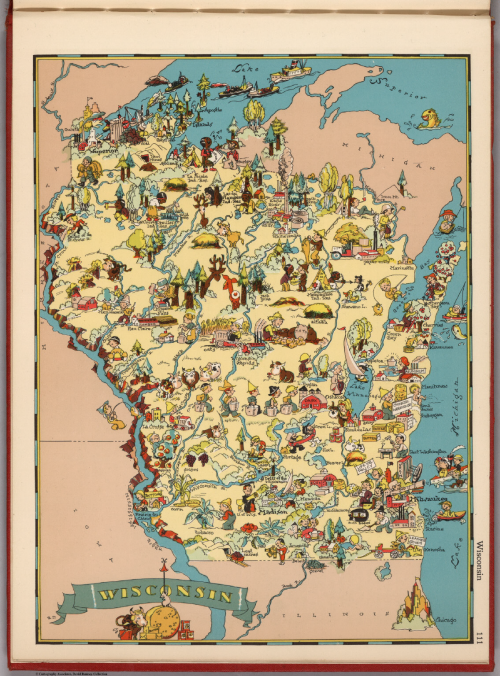 Souvenir maps became a priority in 1957 and McKim was tasked with creating the map. The first edition, measuring 30″ by 45″ was sold during 1958 in a rolled up tube but subsequently, the maps were folded in twelfths measuring 8″ by 15″ to allow them to be sold more readily. McKim was responsible for revisions for two more editions of the map in 1958 and 1959 to add various new attractions as the park grew rapidly and four more of his maps were produced until 1964. They can be identified by the coloured border with the blue one shown here being the 1962 version. All followed the beautiful illustrative form of the original. McKim even managed to make a small appearance in the map himself as he hid his initials (SM) in amongst the trees and bushes next to the covered bridge (above). Many cartographers include small hidden visual treats. McKim’s original maps are now much sought after collectibles for their quality and beauty. McKim was also responsible for drawing the map for the celebrated opening of Euro Disneyland in Paris in a style similar to his original maps. McKim’s work lay the groundwork for theme park mapping globally. His style and approach has been used by countless other artists for many other parks. If the true measure of cartographic greatness is imitation then McKim’s work stands tall. 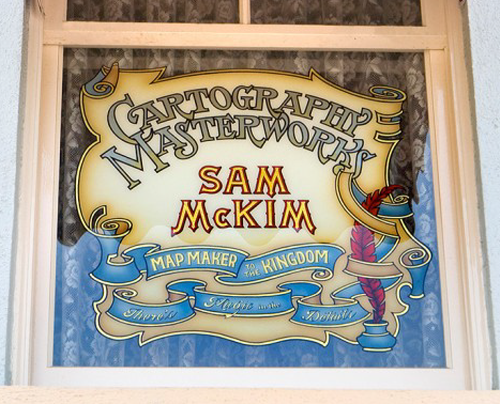 He has been recognised with his own window on Main Street in Disneyland as which states “Cartography Masterworks – Sam McKim – Map Maker of the Kingdom – There’s Magic in the Details.” Attention to detail is more often than not what makes great cartography. McKim’s maps certainly captured the detail of the park, the imaginary world it represented and portrayed it in a captivating style. Discover more about McKim’s work and the multitude of maps of Disneyland here. Of the thousands of maps, illustrations and photographs of Yosemite one sits proud as a work of art that captures the beauty and scale of the valley and is arguably as much loved as the valley itself. Uruguayan Joseph Jacinto ‘Jo’ Mora first visited Yosemite in 1904 and as is the case with the millions of visitors since was left in awe of the sheer magnitude and splendor of the place. The park inspires and whether your interest be climbing, hiking, photography or painting, many are compelled to express their experience. Mora’s map is a response to the sights and sounds he saw in the valley. Mora became fascinated with the American West in the early 1900s and his first visit included a two week journey from San Francisco. Upon arrival his first view of the valey was diarised as “Soon came to ‘O! My! Point.’ Perfectly charming, fine view of part of valley. Photoed. Drank it all in.”. His copious notes, diaries and photographs became a narrative that captured the ever changing natural landscape and the various ways people were seen to be enjoying their stunning surroundings. He began drawing maps in 1927. 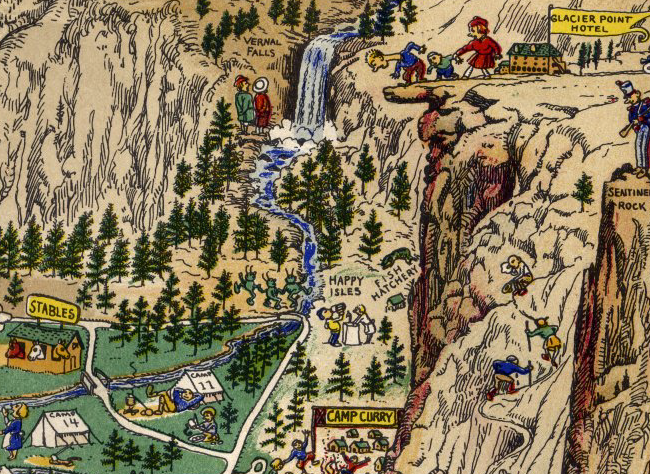 The pictorial, humorous style became a trademark that he applied to many areas but it is the Yosemite map first published in 1931 that remains his most memorable. Many of the people are going about tasks that hint at an autobiographical approach and a representation of Mora’s own experiences. 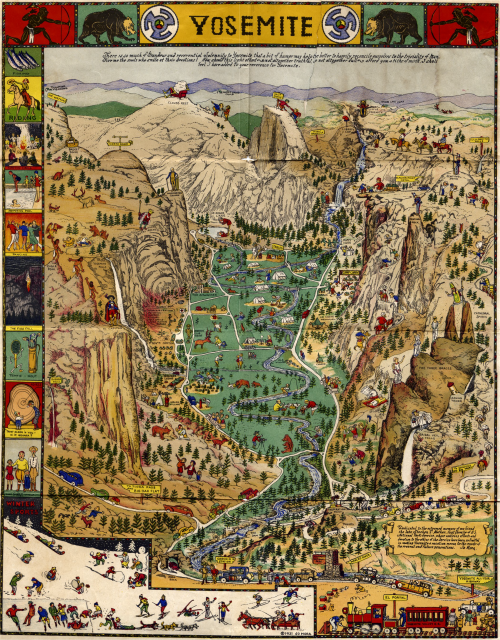 The map was originally printed in black and white but later colour versions published by the Yosemite Park and Curry Company in 1941 and 1949. Many of Mora’s works, including Yosemite, go beyond the humour and depict visual references to indigenous cultures, animals and traditional activities particularly in the border. Mora’s map is not only meant to entertain but also provide a window into the environment. 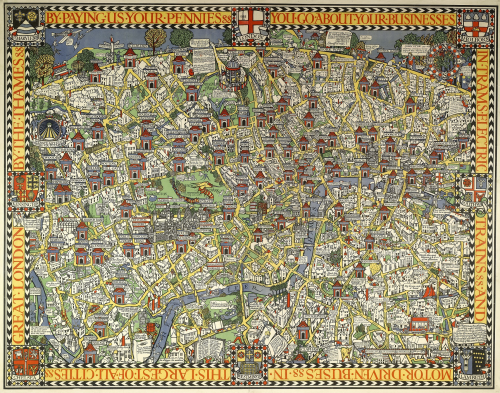 It’s endlessly fascinating and perhaps as adults his work gives us a way to relive some of the magic of children’s pictorial atlases which we’re no longer supposed to reference as much as a ‘proper’ map. This is, though, a proper map…expertely observed, ground truthed and designed with an attractive style. It helps to begin with a magnificent place to map…but combined with the skill, artistry and humour of someone who had a passion for the place makes an exceptional map. More of Jo Mora’s work can be seen at his trust’s web site here. Pictorial maps are usually designed for tourism products since their look and feel is suited to the ephemeral sense of place we might gain of somewhere we only briefly visit. They allow us to recall a few places and the stylised graphics give us a clue of perhaps the main defining feature or characteristic. They are often strongly stereotypical, and sometimes include elements that border on being offensive. Here, the style was adopted in a similar vein yet under completely different circumstances. John G. Drury of the 214th Ordnance Battalion US Govt produced a range of maps for military personnel during the Second World War. Called Mem-O-Maps, their purpose was as a souvenir map on which troops could keep trace of their ‘adventures’ and movements. 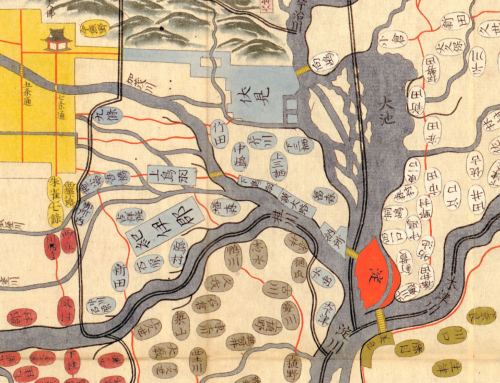 The maps represent an important historical period and integrate pictorial and geographical elements in a unique way. 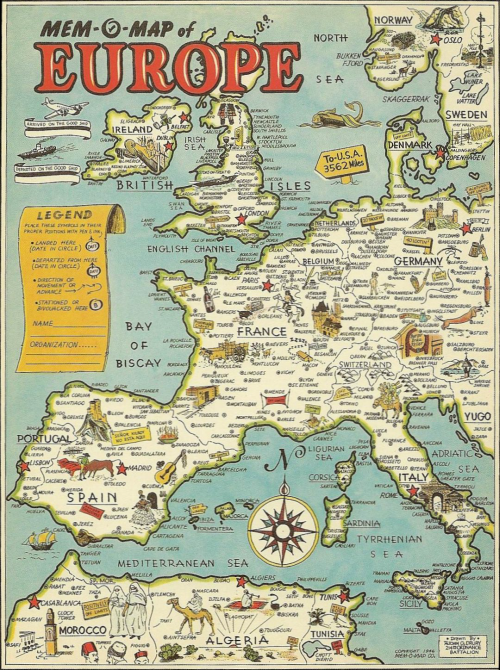 This example, of Europe, includes the use of cartoons and familiar map shapes used as other objects which belie the conditions and experiences that the troops must have faced in reality. They sanitize conflict but, perhaps, provided troops far from home a way of re-casting their experience and imagining themselves as part of something altogether different. As a memento of their individual battles, the maps encouraged servicemen to note where they “landed or anchored” and when, as well as where they “bivoucked or stationed” while there. Some maps note the airfields as well as headquarters and all vignettes of local culture and people. These almost whimsical maps are designed to support the creation of personalised geographies. At a time when digital mapping is beginning to experiment with the creation of personalised content that would render the same map in different ways for different users, Mem-O-Maps demonstrate the principle in action. Each map has a basic level of content yet individuals are encouraged to customise them according to what was unequally important to them. 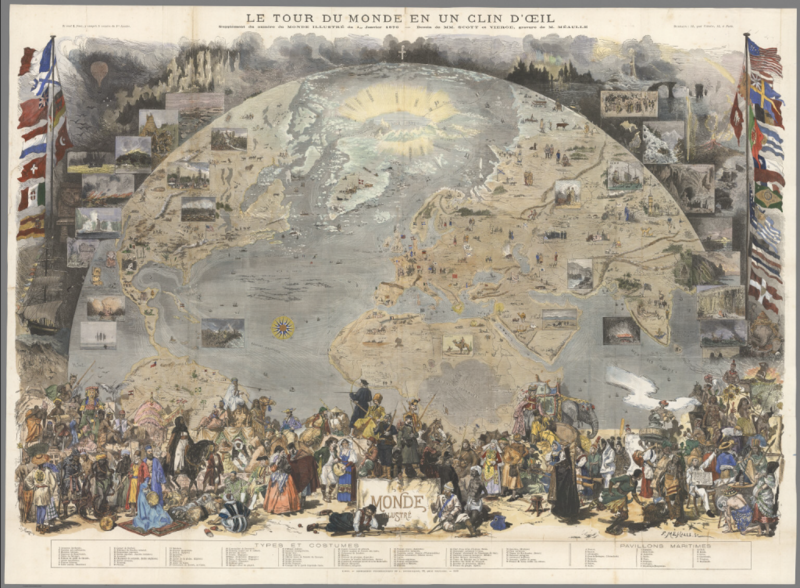 Published by Le Monde Illustré, a 19th century French news magazine, this map demonstrates the artistry of the engraver Meaulle and designers M. Scott and D Vierge. 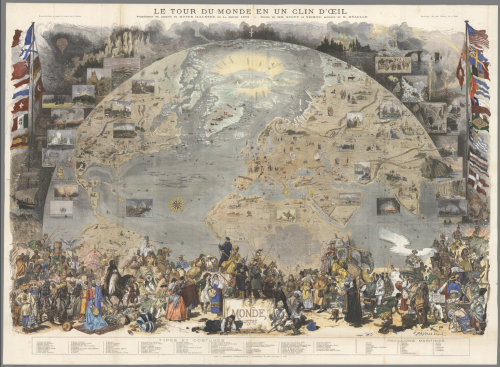 Entitled ‘Around the World in a Wink’ the map was a supplement designed to pictorially illustrate the world using a view from space perspective. The map details flora, fauna, historic events, cultural artifacts and indigenous people. Insets are used to great effect to highlight particular places or moments of historic interest. The map includes a wide array of national flags of major nations as well as figures in traditional costumes and the achievements of various explorers. The map tells a non-linear story and invites readers to explore the different parts of the world. 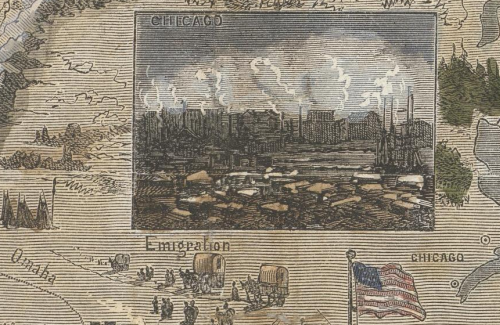 It’s also an example of innovation and ingenuity in cartography since the map includes what appear to be photographs yet this was published in a time when photographic reproduction in print wasn’t technically possible. Instead, the solution was to create a wood-engraved version of the images in such detail that they take on the appearance of a photograph. Cartographers often have to find workarounds to achieve a particular effect. This example illustrates how technical limitations do not necessarily limit the design. Maps have long provided inspiration for more elaborate artwork. The shapes of countries, in particular, can lend themselves to all manner of design opportunity. 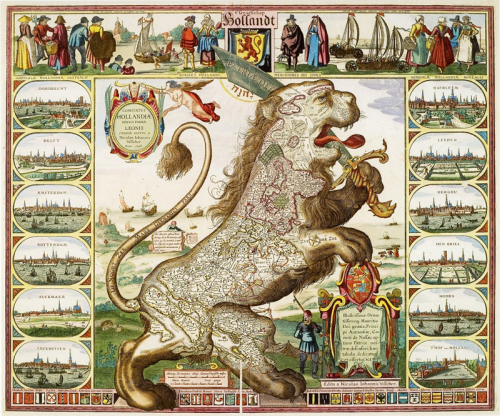 The Lion has long been associated with the Low Countries (current Netherlands, Luxembourg and Belgium) and used in heraldry so it is no surprise that many cartographers as far back as the mid 16th Century have drawn on it for inspiration. Michael Aitzinger is credited with the earliest depiction of a lion as a way of depicting the area. The lion existed in many of the coats of arms and the arching back of the lion rearing up fits perfectly with the shape of the coastline. Claes Janszoon Visscher, a dutch engraver, mapmaker and publisher worked during the Golden Age of Dutch cartography. He began depicting the area in this way in 1609 and he made perhaps the most famous version. 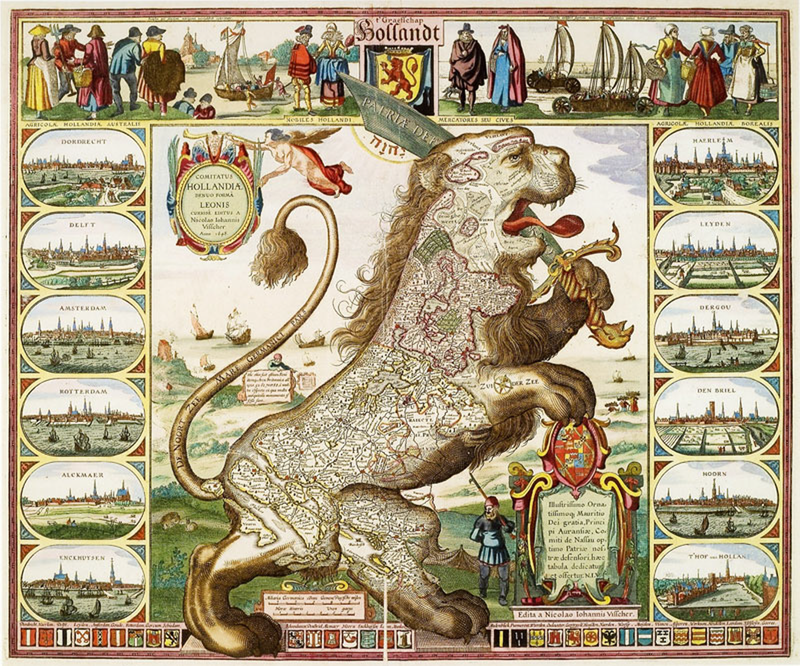 Here, his third version, published in 1648 after the independence of the Dutch Republic, frames the map with panoramas of major Dutch towns and cities as well as incorporating decorative flourishes (cartouches), flags and other imagery. Beautiful artistry and integration of themes and motifs support the map’s use as a proud statement of independence and territorial dominance. As a tool to learn something of the geography of the land the map might be limited but it certainly gives a clear view of nationhood and tells something of the story of the country. Its densely packed layout contains a wealth of information and with the main map as a central actor, the surrounding detail supports the mains story. 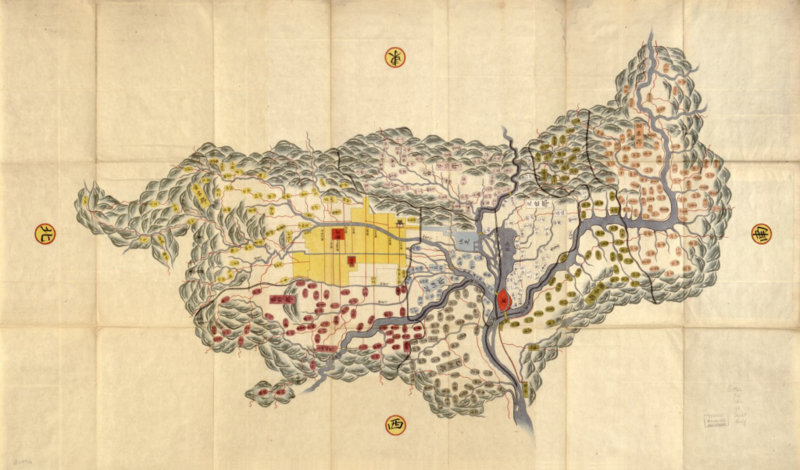 The Yamashiro region of Japan hand-drawn using ink and watercolour around 1800 showing the artistry of far eastern mapping of the period. Scale is warped. East is up. The landscape is depicted pictorially, yet the key features are still easily recognised and give a sense of place. 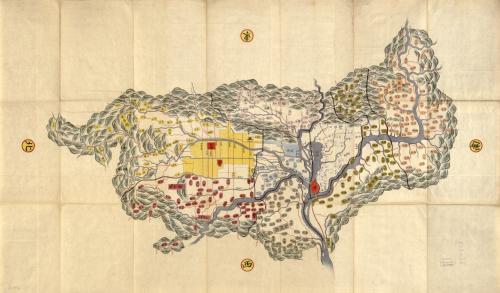 Nijō castle and the Imperial palace (the red areas within the yellow city) are labeled and clearly identify the place we refer to as modern day Kyoto. Ovals are used to depict small villages, rectangles are larger ones and the place names describe modern districts of Kyoto. Temples are illustrated with mimetic symbols and colour is used to denote which ‘gun’ each village is located within. Tapered streams are used to illustrate some of the rivers and streams. Here, then, despite the apparent artistry and simplistic approach, we see both quantitative and qualitative symbology working to communicate something of the size, character and relationship of the populated areas. Hierarchy is also used effectively for transport links and the surrounding mountains are depicted encircling the region rather than being presented planimetrically or, indeed, using a birds-eye representation from the viewer’s orientation. The mapping of London’s Underground rail network predates the classic maps by Harry Beck but as significant features of the landscape the stations play a central role on this beautifully detailed and humorous map from 1914. 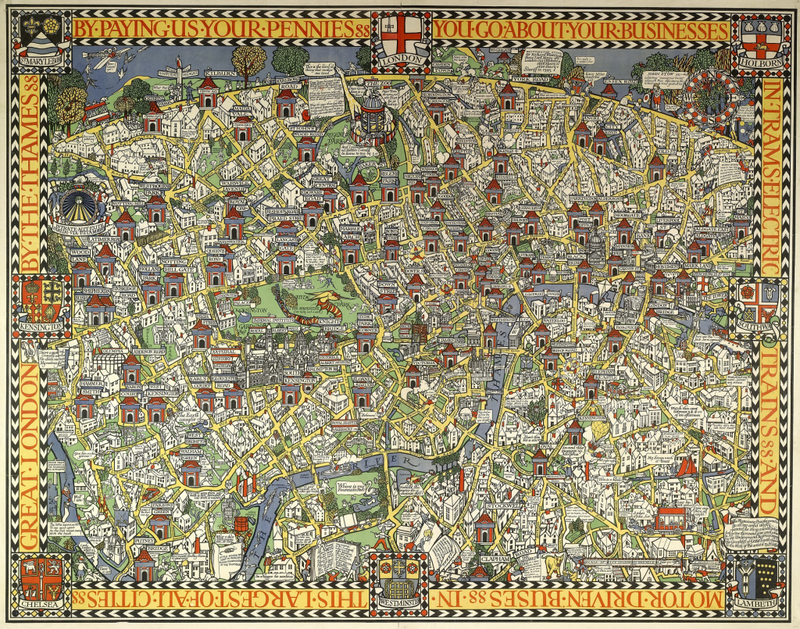 Drawn by MacDonald Gill, the map was not designed for navigation or any functional use but, rather, as a story of a range of countless incidental details of London’s attractions. The map was commissioned as an attempt to overcome the perception of the underground as overcrowded, dirty place with train services that were frequently late. The company was losing money as the trains were empty at weekends. The map, then, was central to a re-branding effort and presented a somewhat impressionable, romantic vision of train travel in an attempt to lure passengers to use the service. Hung at every station, it mixed topographical inaccuracy with a cartoon style and became extremely popular. It also became the first poster to be sold to the public and the tube to this day has a strong connection to artistic works. Gill himself went on to design the official Underground maps between 1920-1924 and has another association with the tube in his tutor, Edward Johnston, who was himself commissioned to design the now famous letter form for the network. The map is full of pithy stories and invites people to engage with the landscape proving that detail is often key to making a good map. There’s a fantastic article on the history of the map including a hi-res version that allows you to explore the map in detail on the BBC web site here.